SOCIAL DANCE! is the perfect companion to our highly successful Bush Dance! kit. 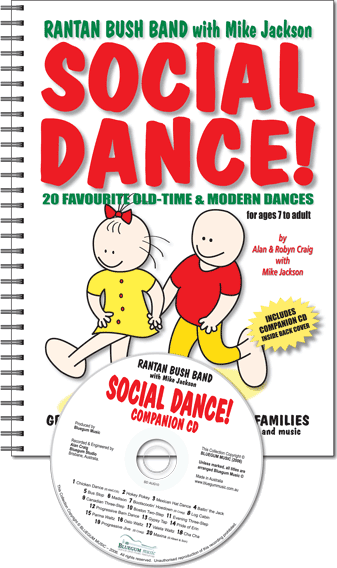 In this book you will find 20 of the most popular old-time, novelty and modern dances – every one fully explained with cartoon illustrations and a wonderful companion CD (cassette also available) featuring Rantan Bush Band. 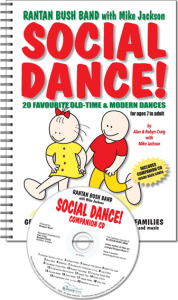 All the music and ‘calls’ for the dances in Social Dance! are contained on the companion CD. The music for each dance is played all the way through with the overdubbed ‘calls’ recorded for at least once through the dance. SOCIAL DANCE! starts where Bush Dance! leaves off. Between them you will have a complete collection of the very best dances for all ages and every occasion – schools, parties, youth-camps, functions and social groups. Both BUSH DANCE! and SOCIAL DANCE! are suitable for ages 7 to adult and the dances are graded from the easiest to the hardest. The text is supported by a comprehensive glossary and every dance has a suggested ‘dance call’ included in the instructions. So, put on the CD, turn up the volume – and take your partners!